Latest News!! We are now proud grandparents of lovely Joy, who arrived on 2018 Oct 27th at 1409 hours, at the National University Hospital, Singapore! We started this business (husband and wife) in the year 2004. In 2004, we were selling Extra Virgin Oil (for healthy cooking) from Spain to some supermarts as well as direct consumers.We don't sell them now. Then, we got into 100% Pure Essential Oil, and we carry more than 50 types of these natural oil, as well as Base Oil generally used for the spa and massage industry. - Yes, if you are looking for 100% Pure Essential Oil in Singapore, we are proud to announce that we do carry many of such oil. - other highly sough after oil like Frankincense, Myrrh, Hyssop, Cinnamon, Cassia, Calamus and Spikenard. - we sell 10ml size, 30ml, 50ml, 100ml, 500ml, 1L and beyond. Through referral and favor of God, we also began to sell products from the Dead Sea and Organic Shea Butter from West Africa (Burkina Faso). Aussie products too! And we cannot forget about products from China as well! - Book of James 4 says : Draw near to God, Resist the devil, and stay Humble! Great teaching! So, we are blessed! Organic Shea Butter has blessed many people with skin challenges, helping some to completely move away from steroid based products. Japanese supplier also approached us to market their products. Today, the Organic Tsubaki (Camellia) oil has blessed many women for their skin (face, neck and body). You cannot get any more authentic than this, straight from the shore of Japan, Kagoshima. Having been a believer of Jesus Christ since mid 2004, we are challenged on our understanding of God's Word, and thank God for the desire in our hearts to keep on, keeping on to search the Truth, dividing the word of truth (2 Tim 2:15). Perhaps Pastor Robert Breaker and his generous YouTube teachings are good resource to learn more of God's Word. Everyone of us need to take personal responsibility to discern, by checking on Scriptures. 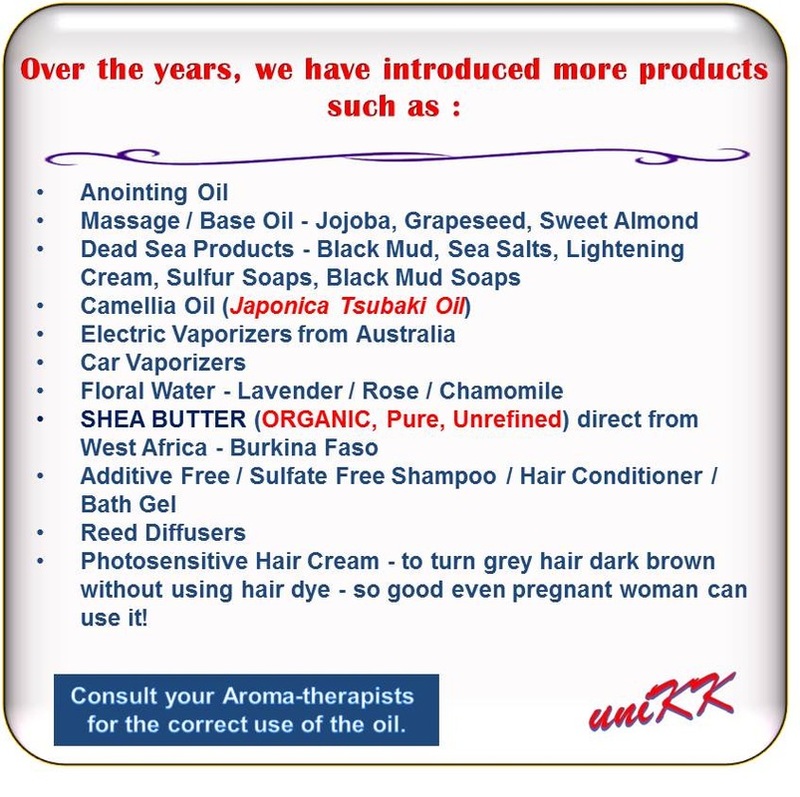 Come visit us and find out more about the products (also other natural products) we sell. Many customers have become friends over the years. P.S. Sometimes customers tell us about challenges in relationship, family, work, etc. We listen, and help if we can too .. without obligation from either party. After all, what's the purpose of life if we just focus on $$ ... Lastly : It is very important that you KNOW what you are buying - whether they are suitable for your body, or may be harmful to use! .. Let the Love of God gives you Peace, Joy and Safety, filled with His abundance this Christmas, 2014. Find out more - contact us. King Solomon says in the Bible (NLT), Ecc 3:12 So I concluded there is nothing better than to be happy and enjoy ourselves as long as we can. So, do enjoy our life, meaning enjoying today and NOW! It was unfortunate that the billionaire owner of an English football club died in the helicopter accident ... at 60.